New from the #1 New York Times bestselling authors of The Nanny Diaries , the highly anticipated sequel that picks up ten years later. More than four million people fell in love with Nan, the smart, spirited, and sympathetic heroine of The Nanny Diaries —now she’s back. After living abroad for twelve years, she and her husband, Ryan, aka H.H., have returned to New York to make a life for themselves. In the midst of getting her new business off the ground and renovating their fixer-upper, Ryan announces his sudden desire to start a family. His timing simply couldn’t be worse. To compound the mounting construction and marital chaos, her former charge, Grayer X, now sixteen years old, makes a drunken, late-night visit, wanting to know why she abandoned him all those years ago. But how can she explain to Grayer what she still hasn’t come to terms with herself? In an attempt to assuage her guilt, yet against every instinct, Nan tries to help Grayer and his younger brother, Stilton, through their parents’ brutal divorce, drawing her back into the ever-bizarre life of Mrs. X and her Upper East Side enclave of power and privilege. After putting miles and years between herself and this world, Nan find she’s once again on the front line of the battle with the couture-clad elite for their children’s well-being. 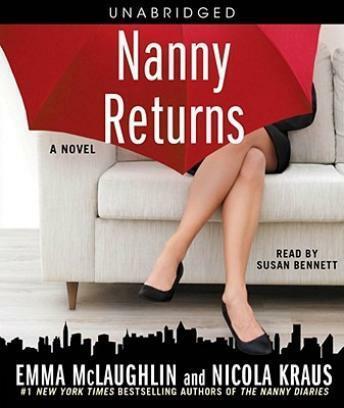 With its whip-smart dialogue and keen observations of modern life, Nanny Returns gives a firsthand tour of what happens when a community that chose money over love finds themselves with neither. I enjoyed this insight to a very distinctive family and the nanny who Grayer sought out to find solace in. It was believable. I am in a similar situation in real life. I love my “other daughter” who adopted me. While not as funny as the first novel, it's pretty good and quite entertaining. As with the original story, the strangest things happen to Nan, but it's all still believable. I enjoyed the story and do recommend it. this was a disappointment. The Nanny Diaries was a great book, very interesting. This was was terrible! I was very disappointed. The only bright spot was the reader did a good job. This was a pretty good book. It was similar to the first book of the series, the Nanny Diaries. Like the original book, there were times of really painful examples of bad parenting. At times, almost too much to bear. The story line centered around 1) Nan's renewed relationship with the X boys (Greyor from the original book and his little brother) 2) Nan's job as an HR person for a school and 3) Nan's reaction to a moneypit house re-construction. I enjoyed the storyline with the X boys. It was nice to see some resolution to this storyline from the 1st book. I hated the storyline about Nan's job. She was the HR rep and helped the horrible people in charge to unfairly fire a good teacher. It was just too much -- so depressing. The house storyline was pretty funny in certain spots. If the school storyline hadn't been there, I think that I would have liked the book better. Overall, it is a worthwhile read if you liked the first one.